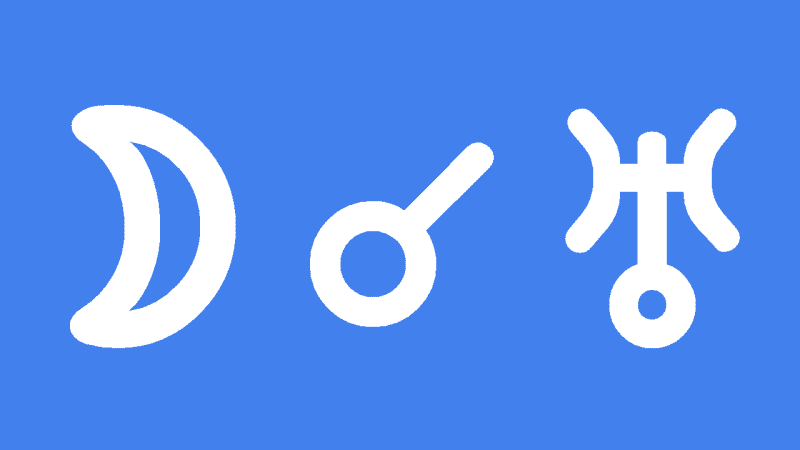 Moon conjunct Uranus in the natal chart stimulates (Uranus) the hypothalamus (Moon). The hypothalamus is a gland in the brain which regulates parenting and attachment behaviours, as well as hunger, thirst, fatigue, sleep, and circadian rhythms. It is directly linked to, and equally important as the pituitary gland (Sun). The stimulation of primal instincts has a tremendous impact on the life of the person with this aspect. With parenting and attachment behaviours, we often find that one of the parents is odd, absent, or emotionally detached. There may be a family history of sudden events, accidents, or psychic phenomena. Ancestry may be peculiar or noteworthy in some way. Sudden onset of emotional volatility can be expected, verging on hysteria. However, these episodes usually pass as quickly as they started. Relationships can be affected with an initial intensity or fascination, however maintaining this interest over the longer term often proves difficult. Moon conjunct Uranus strongly correlates to 7 year cycles. 7 x 12 = 84 = orbital period of Uranus. The seven-year itch is also a psychological term. Family and emotional attachments are ruled by the Moon, while detachment is ruled by Uranus. Satisfying the need for stimulation is vital in dealing with the impulsive nature of Moon conjunct Uranus. The Internet is an ideal source of this stimulation as the Internet and computers are ruled by Uranus. Acceptance of, and family support of any psychic abilities are essential for the young person with this aspect. It is important for this person not to feel an outcast. Many of their special abilities or talents have been demonized by the major religions over the last 2000 years. What Moon conjunct Uranus wants most of all is to feel an integral and valued part of the family, social circle and community. This is also the area that requires the most effort to achieve. Transiting Moon conjunct Uranus is felt as subconscious impulsiveness. Sudden events may result in relationship upsets, family disputes, or a major change in direction regarding close relationships. Other changes may include the primal urges such as appetite and sleeping patterns. You may fluctuate between extended periods of wakefulness, then periods of lethargy. It is best to act on instinct during this period because any psychic talents are being stimulated. Thinking too much or trying to be patient probably won’t work out so well. Flashes of insight should be taken seriously, so take a chance and back yourself. It is important that you express yourself to the max, and not be held back by tradition or the standards or your society. Some eccentric or weird actions may not turn out so well, but one or two may prove extremely valuable. Expect to feel somewhat isolated or detached from your loved ones during this period. This is the standard for any of the astrological aspects or transits associated with psychic ability. This interpretation for Moon conjunct Uranus transit applies to a lunar eclipse and full moon conjunct Uranus. Also your twitter account did not work. Food for thought! Thanks Jamie! Hi Helen, I will be posting more aspects in a few weeks and will do the opposition for you. Fun fact: My mum consulted a clairvoyant about me many years ago. She told her that I should be careful with the sea especially at the ages 7, 14, 21, 28, 35, and so on. I didn’t notice this had some coincidental link with my natal Moon conjunct Uranus until I read this post. Hi, I have the conjunction near 0 degree orb in my natal chart. I’ve changed schools and residences 7 times as a youth before the age of 16. Born on July (7) 16th(7). Friends are more like family. I am a libertarian socialist. I love metaphysics but at the same time question everything about it. Naom Chromsky and Jiddu Krishnamurti are two people I can really identify with. I abhor dogma in religion and politics. I don’t understand how people can put so much “faith” in authority. I’ll take the opinion of a beggar over Donald Trump if it makes more sense. I don’t fit into this world of status, wealth, and power overall. I’d love to contribute to society in a meaningful way; Yet, I am quite cynical of my species. I want to change things for the state of equality. Although, I wonder if my thoughts are a waste of time or too utopian. I have it in the 4th with my Moon, we think a lot alike. Also moved a bazillion times as a child, at home with my Mom in infancy, and as teen though state care, I was un- adoptable. So spent all my time in Group Homes. Far more violent than foster, and fitting for a Uranus, Scorpio 4th. Too much of a ” PTSD problem child”. I do wonder what sort of experiments were done to me in this house. It bewilders me when people talk about visiting old classmates and family reunions. Just don’t happen with me. My Mom was a hyper Virgo, square Gemini Moon, Mars opp Moon conjunct Antares. Not “Uranian energy” but disruptive doesn’t tell the half of it. You are a very interesting person…. So happy to see Elyse’s name on the celeb list. What a nice comment! All the kids want to be famous these days. Moon conjunct Uranus in 6th near 0 degree orb. Do you know how much we are conditioned everyday? What if we were free from this conditioning? What would be possible? Thank you Jamie, I like your web site. I have moon in close conjunction with Uranus in the fourth house, and as someone else stated I regard close friends as important as birth family .I have also moved home many times in life. I just had a shocking emotional experience with this transit. We were out having fun at the skating rink (recreational activities, uranus is in my fifth house) and my step-sister (family) broke her arm as a result of a sudden collision when a fast roller-blader hit her. I was oddly detached, but I remained calm and was able to inform my step-mom of the situation and to come quickly. Although bystanders were being stupidly frustrating (“Is she ok?”), I was able to ignore them and do what I needed to. I couldn’t help but feel guilty for my detached reaction, yet I am glad that I handled the situation well. I hope this helps to enlighten everyone on the kinds of experiences that this transit can bring. Uranus in the 5th sextiles Moon/Sun/Marz in the 3rd and I seem to fall pregnant unexpectedly every 6 or 7yrs! My daughter has an exact conjunction of the transitting moon on her Uranus, do you think this is a pregnancy labor trigger? I do??!! LOL!! Not sure if this will resonate with anyone but I have this aspect with an almost 0 degree orb.. my mom had a brain aneurysm immediately after giving birth to me. She also passed away from from leukemia when I was 14.